Description: A couple more trains sit at the northbound platforms. Description: Here's the rebuilder's plate on the MBTA Rebuild. Title: Northbound MBTA Commuter Train Boarding. Description: Another northbound's passengers come out on the platform and load onto the train. Description: A different version of a past photo. However, this one is a little darker. Description: 309 to Lowell makes the stop at Winchester Center. Description: Middleboro-bound 017 rounds the bend approching the Armstrong crossing. Description: GP40MC 1127 provides the power for inbound 2054 today leaving North Ave. in Whitman. 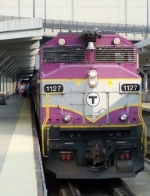 Description: 1127 awaits departure time to head back to North Station while 1128 waits for Monday. Description: With an MBTA locomotive for the Juniata Shops 19G continues west after a crew change at Harrisburg. Description: Shoving an inbound out of Ayer.